Imagine getting a brand new car. In the beginning you’ll probably spend considerable time and effort keeping it as pristine as possible. You might wash it every week, faithfully get the oil changed according to schedule, and only fill it with premium gasoline. As time wears on and the newness wears off, you likely won’t go to such extremes. But would you ever stop getting oil changes or filling up with gas? Of course you wouldn’t. Just like that new car, when your company first invested in Adobe Analytics, the implementation project would have kicked off with a lot of excitement, resources and business sponsorship. As time passed, attention and resources often shift to other projects. As your analysts begin handling the day-to-day reporting requests, efforts tend to stall when it comes to keeping with some of the everyday basics like best practices and maintenance. That’s why periodically conducting an Adobe Analytics Audit is critical. In fact, I think you may be surprised by how many custom variables are not accurate or not providing value in the audit example shared within the discussion of the audit process. Beyond these technical details, I will share strategic rationale including the top reasons for an audit, and most importantly, specific benefits our clients have seen in a variety of industries. Get set to learn how you can re-energize your team and improve stakeholder confidence. In addition to the improvements available from Adobe, your implementation will need to be maintained over time. This is especially true in large or fast-moving companies where communication may be limited across teams, and multiple stakeholders are likely implementing tracking across business units. Your company is relying on your analytics data to make business decisions and if your Adobe Analytics implementation has not been well maintained, the fact is that you could be relying on bad or incomplete data. If you have lost faith in the data, it’s not the solution’s fault; it’s because your implementation needs attention. The easiest way to resolve maintenance issues is to conduct regular analytics audits of your solution. Audit is a terrible word, no one wants to be audited, so let’s think of it as a routine check-up. Just like maintenance is needed to keep your vehicle running well today, and down the road, your data and your analytics solution are no different. Ensuring data quality and ROI requires investments in your business and routine maintenance of your Adobe Analytics implementation. Ensuring data quality and ROI requires investments in your business and routine maintenance of your Adobe Analytics implementation. Click & Tweet! Have you lost confidence in your data? It is easier, and less expensive, to perform an audit and update your Adobe Analytics implementation than to migrate to a brand new tool. Data often goes unused because key resources leave the company and the implementation is not widely understood. Adobe Analytics is a big investment and you should be getting the maximum return on that investment. Analytics tools evolve, you should periodically review your implementation to make sure you are following current Adobe Analytics implementation best practices, or taking advantage of the latest features. Realign your Adobe Analytics implementation and configuration with your business objectives. As you make improvements to your website (and apps), it is important to continue to validate your analytics solution. If you make QA’ing Adobe Analytics a part of your release cycle you will minimize the chance that your data will be contaminated or ruined. Even with ongoing maintenance and QA, your website and your business may evolve beyond your current Adobe Analytics strategy. Your website is not static, so your Adobe Analytics implementation and strategy shouldn’t be either. An audit and cleanup is also great way to energize your team and get business stakeholders reinvested in your analytics solution and the value it drives. A holistic analytics audit not only evaluates your data quality and data integrity, but also your data strategy. This ensures that you not only have accurate data, but more importantly, actionable and relevant data. This is not an automated process, and the outcome is a detailed report of all variables that are currently being captured along with any missed opportunities. Here are the proper steps for completing an Adobe Analytics Audit. A holistic analytics audit not only evaluates your data quality and data integrity, but also your data strategy. Click & Tweet! Before starting the audit, it is critical that your organization’s key stakeholders have a documented analytics tracking strategy. A tracking strategy documents your companies goals and objectives to provide a full understanding of your unique tracking needs and measure how you’re performing against your KPIs. Looking at not only which data variables you are capturing, but your technical implementation as well, leads to important documentation and feedback that ultimately informs strategic recommendations for an improved analytics implementation. Reviewing each variable ensures it is not only capturing data, but accurate and actionable data, and that the values in the reports are optimized to provide the data needed to measure against your business objectives. 3 out of every 4 variables used in reports, are reporting inaccurate data. Click & Tweet! For example, the image below is from an actual audit and provides a detailed look at the current state and recommended actions for custom variables. Looking across the entire implementation, only 25% of all custom variables are good to use with no changes to the implementation. This means 3 out of every 4 variables used in reports, are reporting inaccurate data. 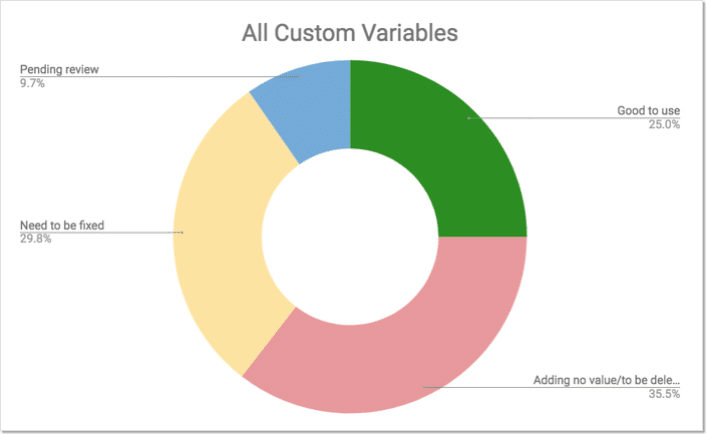 Further, just over one third of all custom variables are currently adding no particular value to the business and can be deleted to use for another purpose. This is important because custom variables are not unlimited in Adobe Analytics, and every report should exist for a reason. The image also identifies that about one third of all custom variables need to be repaired, this is especially concerning since these variables are used in everyday reports. By reviewing your configuration you can ensure your data is being counted and allocated in a way that makes sense for your business to provide accurate reporting. 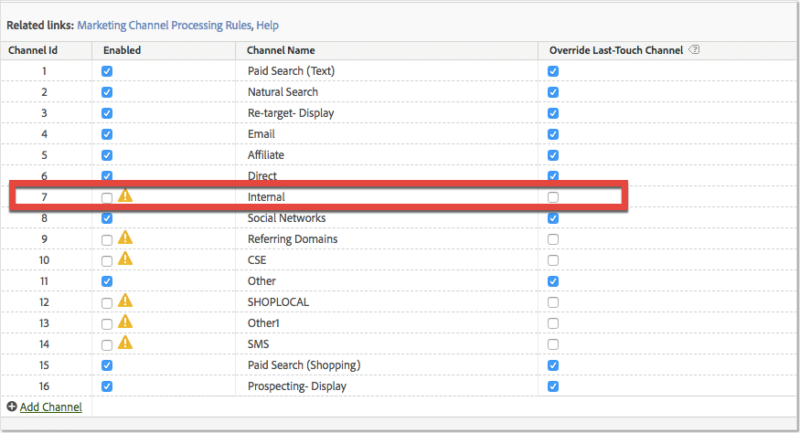 Along with documented recommendations, your Adobe Analytics Audit will feature strategic recommendations for future custom event tracking, classifications, processing rules, data connectors, account configurations, reporting and advanced segmentation insights. For example, the graph below shows the power of reviews follow-up email landing page. Blast then identified the intended purpose, current status, reason and recommended action for this event. Intended Purpose: This event was meant to fire when someone landed on a power reviews follow-up email landing page. Current Status: There was about a 3 month period where this event actually was being used (May – Jul 2014) and since then there have been no hits. Reason: The review process has changed since then and the tracking has not been updated. Recommended Action: We should definitely be tracking reviews. We should fix this event so it fires again. We will review your code set to ensure you are using the latest version of appMeasurement code, or the latest mobile SDK. By reviewing your campaign tracking and marketing channels configuration you can ensure your channels are configured correctly, reporting accurately, giving you the ability to optimize your marketing mix and ROI. Data driven organizations understand the value of quality and actionable data. When the Adobe Analytics Audit process above is followed, and findings implemented, you will feel confident in your data again. You will be able to showcase your performance to stakeholders and will see positive ROI from your analytics investment. A news and media client was collecting their data in a siloed way across web, Android, and iOS apps. By realigning all their dimensions, then collecting data in a central report suite, for the first time they were able to understand which articles were most popular across all platforms. An ecommerce retailer was using a legacy implementation that had not evolved as their site was redesigned. By providing them with a roadmap to better track customer journey and conversion points throughout the cart process, they were able to identify and optimize any pain points within their conversion funnel. The main analytics team lead for a large scale department store recently left the team with a complicated Adobe Analytics implementation that many did not fully understand. By auditing and simplifying the implementation, their team was able to find valuable insights faster and easier. This provided them with the ability to make quick data-driven business decisions. A real estate client was capturing property IDs in 5 different reports. By leveraging a list eVar, we were able to track the customer journey from property impression through to submitting a contact form. This provided our client with a view of the entire funnel in a single report. If you want to become, or continue to be, a data-driven organization, you need to ensure that your data is driving you in the right direction. An Adobe Analytics audit will ensure the health of your analytics by periodically documenting the current state of your Adobe Analytics implementation, and providing recommendations for improvement that align with your business objectives. If you want to become, or continue to be, a data-driven organization, you need to ensure that your data is driving you in the right direction. Click & Tweet! If you have any questions about how an audit works, are looking for other industry examples or benefits, drop me a comment on this post and I’d be happy to answer them. I’d also love to hear from others about the benefits their organization experienced from an analytics audit and how it helped EVOLVE your business. Aimee has more than 10 years of experience with web analytics solutions, including Adobe Analytics, Google Analytics and much more. She is a strategic thinker with the ability to analyze data, identify trends, and translate her findings into marketing and sales strategies that drive growth. 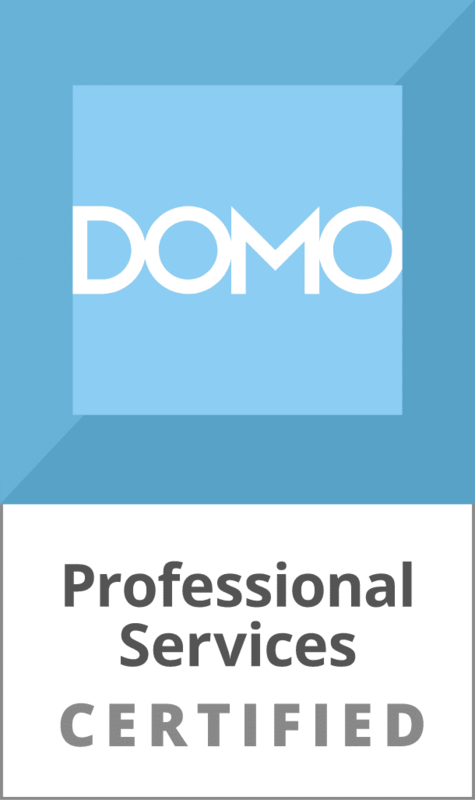 Aimee Bos has written 2 posts on the Web Analytics Blog.